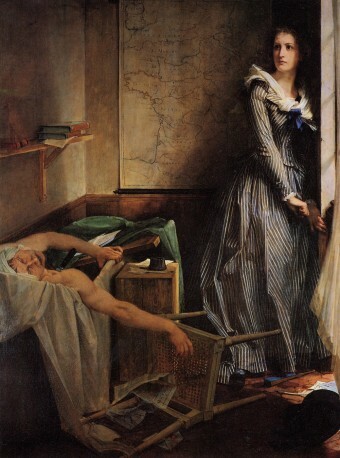 Charlotte Corday hailed from Normandy where her family was part of the minor nobility. Despite her (slightly) blue blood, she supported the Revolution and backed the Gironde, a group of moderate republicans who advocated a constitutional government. She believed their reasoned approach would enable France to avoid all-out civil war and save the country from ruin. The rise of the violent and radical Montagnards alarmed Corday. Jean Paul Marat was particularly influential and powerful during the infamous Reign of Terror as he could use his newspaper L’Ami du Peuple (the Friend of the People) to spread the Jacobin viewpoint. In a nutshell, they believed the only way to keep the Revolution safe from civil war and foreign interference was by executing anyone who dared speak against it. A popular movement that began as a cry for liberty had become the worst kind of tyranny. It took two attempts, but Corday finally gained entry to Marat’s home in the evening of July 13, 1793, by claiming to have knowledge of a Girondist uprising. She made her way in to Marat’s inner sanctum with a concealed kitchen knife with a six-inch blade. By this stage of his life, Marat was conducting most of his business from his bathtub. This was likely due to a debilitating skin disorder he may have picked up hiding from his enemies in the Paris sewers. Whatever the case, he spent significant time every day soaking in medicinal herbs seeking relief from the relentless discomfort and itching. As promised, Charlotte gave Marat a list of people involved with the Girondist cause. After imparting this information, she plunged her knife deep into his chest, slicing through his lung, aorta and left ventricle, rendering the information useless. Marat died almost immediately. Corday then sat and awaited her eventual arrest. At her trial, she was insistent that she committed her crime alone and that “I killed one man to save 100,000”, no doubt alluding to Maximilien Robespierre’s justification for the execution of King Louis XVI. Charlotte went to the guillotine a mere four days after she killed Jean Paul Marat. In the immediate aftermath of the event, Marat was regarded as a martyr for France. He was lauded as a hero and buried at the Pantheon. Marat, and everything he stood for, was idealized and championed – completely the opposite of what Charlotte Corday had hoped for. Immediately after being decapitated, a carpenter who had been hired to make repairs to the guillotine by the name of Legros picked up her head and slapped her face. (He was later sentenced to three months in prison for this act. Cutting off her head- A-OK. Slapping said head- imprisonable offense.) Corday’s decapitated remains were carelessly tossed into an open grave with so many other victims of the Reign of Terror. But, what goes around comes around. Many of those responsible for changing France’s mostly peaceful bid for revolution into a bloodbath turned on each other and met the same grisly end on the guillotine. The guillotine became popular during the French revolution as the people’s “avenger” against their tyrants, though first used on the 25th of April, 1792 to execute a common thief- Nicolas Pelletier. It continued to be used as France’s main method of judicial execution until the abolition of capital punishment in France in 1981. The last person executed via guillotine in France was a Tunisian immigrant named Hamida Djandoubi, on the 10th of September, 1977. Djandoubi was convicted of torturing and murdering his 21-year-old ex-girlfriend, Elisabeth Bousquet, in Marseille. Was it not difficult for him to do this “immediately after” he had been “decapitated”? Writers — or the editor — MUST be careful to find and fix misplaced modifiers before they can be published (and left unchanged for months)! Even the words that give the carpenter’s name are awkwardly out of position! “Immediately after Corday had been decapitated, a carpenter named Legros, who had been hired [etc.] …”.